Today, we will be looking at one of the oldest and most well-established investment platforms in the UK; Fidelity Investments. In this completely independent & unbiased review, we will be looking at everything Fidelity has to offer. There are so many investment platforms out there that it can sometimes be overwhelming. How do you decide which one is best for you? Today, we will be looking at Fidelity’s modus operandi, as well as taking an in-depth look at how its most popular products work. In this particular case, we will be looking more specifically at Fidelity’s ISA Account and Fidelity’s SIPP Account. In this article, we will be looking, specifically, at Fidelity’s consumer platform, and it would, therefore, be more correct to call this a Fidelity International Review. As always, I recommend you don’t take any of what I say for granted and do your own research. Let’s start by having a look at Fidelity’s origins. 9 What Investment Products Does Fidelity International offer? 10 How Does Fidelity Work? 14 What’s a Fulcrum Fee? Fidelity International, formerly Fidelity Worldwide Investment, is a company that provides investment management services including mutual funds, pension management and fund platforms to private and institutional investors. In the UK, it has over 1 million clients and manages over $80 billion in assets. The company is privately owned; the majority of the company is owned by its employees, though the Johnson family still owns a substantial minority of 39.89% according to regulatory filings. With Fidelity International, you can invest in any of these two main accounts. This account allows you to invest your money in an efficient tax-optimized way. As we mentioned in our last article on Moneyfarm, ISA stands for Individual Savings Account. With an ISA, U.K. citizens can save, and invest, up to £20.000 per year without having to pay any income tax, which is great. 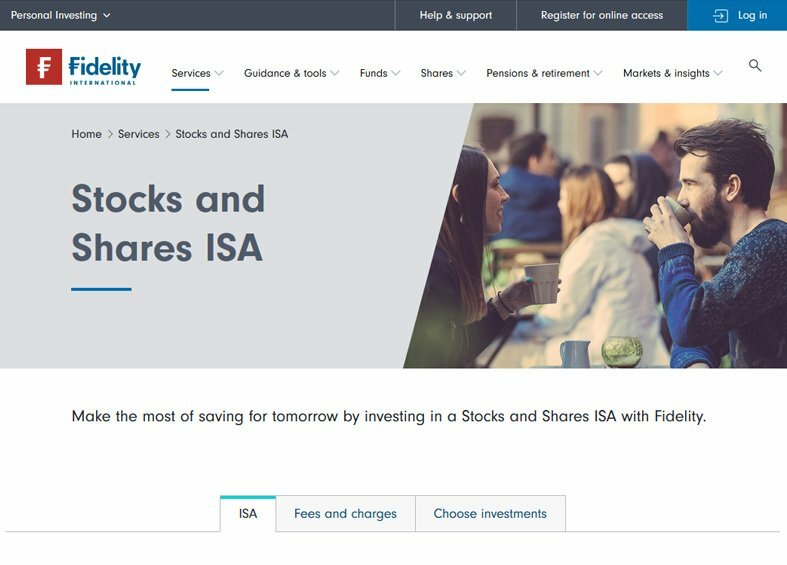 One can open a Fidelity ISA account with as little as £50 a month or you may transfer an existing Stocks and Shares ISA from another provider. The Fidelity ISA will give you access to a wide array of unit trusts ETFs. Read more about Fidelity ISA Accounts here. If you choose to invest in a Fidelity ISA up until the 31st March 2019, you will be entered into a prize draw where you can win back the amount you initially invest, effectively doubling your investment. Also known as Self-Investment Personal Pension. Manage a pension yourself. You choose what it’s invested in, how much is paid in and when. Make contributions through lump sums, or with regular savings plans, but you can’t generally withdraw money until the age of 55. Plus, the government (HMRC) will give you 20% tax relief on anything paid into a pension (up to a specific limit, depending on your circumstances)*. A SIPP is a great way to start saving for the future, and with Fidelity, you can open or transfer an account and start investing in a wide range of ETFs and funds. Read more about Fidelity SIPP Accounts here. Fidelity also offers the possibility of opening a Junior version of these accounts. With the Junior ISA or SIPP, a legal guardian can open an account in the name of a minor, and start saving and investing money on their behalf. Once the child reaches the age of 18 he can then access the funds and manage them as he or she sees fit. 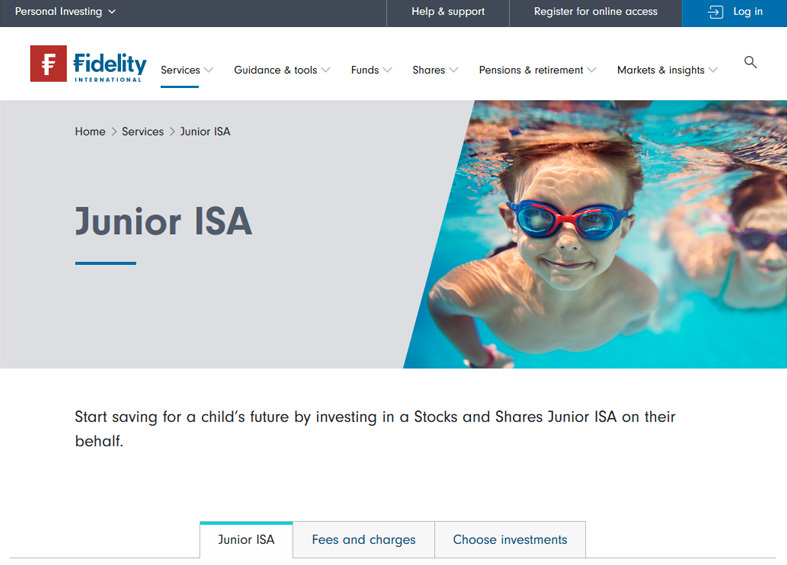 Currently, with a Junior ISA, you can invest up to £4128 into a Junior ISA, as that is their ISA allowance. With the Fidelity Junior SIPP, the same rules apply as with the regular version. You will get a 20% tax relief for investments up to £2880, increasing the total investment to £3600. 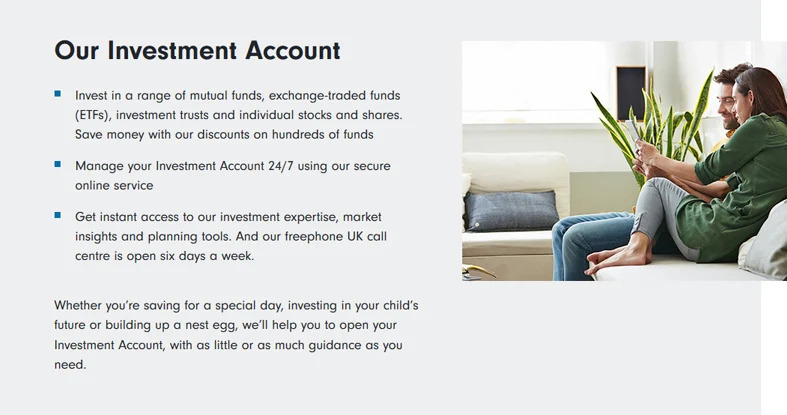 This is basically a general investment account, which lets you invest in all of the ETFs and funds that Fidelity has available in whichever way you choose. However, it’s important to take into account that with this account your income and gains will be subject to taxation. Fidelity Retirement Services – Fidelity will put at your disposal a team of experts to assess you in your financial planning needs when it comes to your pension.They will help you find the most tax-efficient way to deal with this issue, which can be quite problematic, especially when we are talking about multiple pension pots. Fidelity Wealth – Like with any money manager, the more money you have, the better service you will get. Fidelity Wealth is a service dedicated to those people investing over £250.000. Fidelity Wealth clients will have access to a personal relationship manager who’s aim is to provide an on-going assessment of investment strategies and investment products. These clients will also enjoy a lower service Fee. If the amount you invest with Fidelity is over £1 million you will actually get 0 service fees. What Investment Products Does Fidelity International offer? With Fidelity, you can invest in a great number of funds, trusts, and ETFs. However, it’s important to note that with Fidelity International you cannot invest in single shares. If you wish to do this you will have to look at a different broker or platform such as DeGiro, a very popular low-cost option in Europe, or even Hargreaves Lansdown. Fidelity Pathfinder – This service allows clients to find a suitable portfolio according to their risk profile. Fidelity select 50 -This option features 50 funds selected and reviewed by Fidelity analysts twice a year. These funds can then be filtered through according to investment preferences like risk, growth vs income etc. Fidelity also has the select 50 Balanced which is comprised of a sample of each of its select 50 funds. In terms of account setup, the answer is quite straightforward. A bank or building society details, if you wish to invest on a regular monthly basis. Now, it’s time to decide what you want to invest in. If you are completely lost with this decision, this is where Pathfinder comes in. This software will help you decide which investments are better for you depending on your risk profile. Not unlike other Robo-advisors, like Moneyfarm, the Pathfinder will ask you a set of questions and determine which investment is best for you. The robo-advisor, will basically direct you to either an actively managed portfolio or a cheaper passive Fidelity investment fund. However, in this area, Fidelity has some very steep competition. Other AI based financial advisors like Moneyfarm or Nutmeg offer a lot more variety. But, most importantly, they are quite a bit less expensive than Fidelity. As we already saw in our Moneyfarm review, investing through their service could cost you anywhere between 0.7% to 0.4% of your investment. Fidelity, on the other hand, would charge substantially more. Let’s take, for example, the Fidelity Multi Asset Adventurous Open Fund. This fund ‘s target is to achieve growth, and it is actively managed. This would carry a service fee of around 1.75%, from Fidelity’s side, but we would also have to add to this transaction costs within the fund which could mount up to around 0.6%. A cheaper option would be to simply use of their passive funds, which would have a service fee of around 0.6% and additional transaction costs of around 0.2% a year. If you are looking for the cheapest option, then I would recommend buying the Vanguard Lifestrategy fund. This would carry a cost of only 0.37% a year and an additional 0.11% in transaction costs. For the more seasoned investor, you can pick a more hands-on approach, and choose your own ETFs or investments funds. The middle of the road option would be to go with the Fidelity Select 50. This is a selection of funds rated according to its own in-house research and is a great way to narrow down all the available options. On the other hand, you can you use Fidelity’s Investment Fund Finder, and choose from over 2800 funds, 118, investments trusts and 91 ETFs. You can filter your search according to different parameters such as; provider, charges, investment sector, risk profile, management style or even Morningstar rating. However, Fidelity’s platform is not the most user-friendly and in this regard, is somewhat disappointing. Fidelity’s platform is hard to navigate, and finding and comparing funds can be time-consuming and cumbersome. One way to get around this is to conduct your research outside of Fidelity, but this is no excuse for the poor performance in this area. From the feel I get on the platform, it seems like it might have been made with mobile and tablet users in mind, but, personally, I like to use my desktop computer when conducting research and making transactions. The whole point of these online-brokers and investment platforms is to make your life easier. The process of investing has to be made simple for the consumer, while the broker deals with all the hard-stuff behind the scenes, but this is not the feeling you get with Fidelity. Of course, much like anything else, we could say that using the platform effectively is just a matter of time, and getting to know it. The process of opening an ISA account is fast and easy. And you can make investments around the clock from the comfort of your home, both on the computer and by phone. In terms of fees, which I will discuss further on later this review, Fidelity is quite competitive, especially for medium sized investors. Their rates are quite good if you are investing anywhere between 10.000-100.000 pounds. A lot of other providers tend to focus on either the high end or the low end, making it necessary for one to keep moving his money around from one provider to the other. In this sense, Fidelity offers a good one-stop solution. Furthermore, Fidelity is trying to innovate in this area, by introducing a fulcrum fee. A fulcrum fee is a performance-based fee that adjusts up or down based on outperforming or underperforming a benchmark. Fulcrum fees can be charged by a financial adviser or an asset manager to qualified clients to link outperformance (or lack thereof) to compensation. But most importantly, with Fidelity’s ISA account you will be able to choose from thousands of funds, shares, exchange-traded funds (ETFs) or investment trusts. Save money with our discounts on hundreds of funds. Furthermore, you will get instant access to our investment expertise, market insights and planning tools. And our freephone UK and Ireland call centres are open from Monday to Saturday. And finally, it’s important to note that Fidelity’s ISA has no exit fees at all, which means you can change providers at any time if you are not satisfied with the service. I like this a lot because it definitely gives Fidelity an incentive to work harder to keep you happy. Here’s a table of the fees you can expect when using Fidelity. like with any broker, the fees are calculated as a percentage of your total portfolio value, and the larger your portfolio, the lower this percentage gets. It’s important to note a couple things to fully comprehend the fees Fidelity charges. Fidelity adds all your accounts together before they work out which fee band you’re in, meaning they try to charge you the lowest rate. Also, the portion of the fee you pay on exchange-traded investments (shares, exchange-traded funds (ETFs), bonds, etc.) is capped at £45. Having said this, you do not pay a service fee on exchange-traded investments held in an Investment Account. An SIPP is a great way to start saving for retirement. Like with the Fidelity ISA, you can manage your investments 24/7 using the online service and choose from thousands of funds, exchange-traded funds (ETFs) or investment trusts to invest your pension in. It can also make a good home if you’re looking to bring together several pension pots, helping you take control of your retirement savings and plan more effectively. 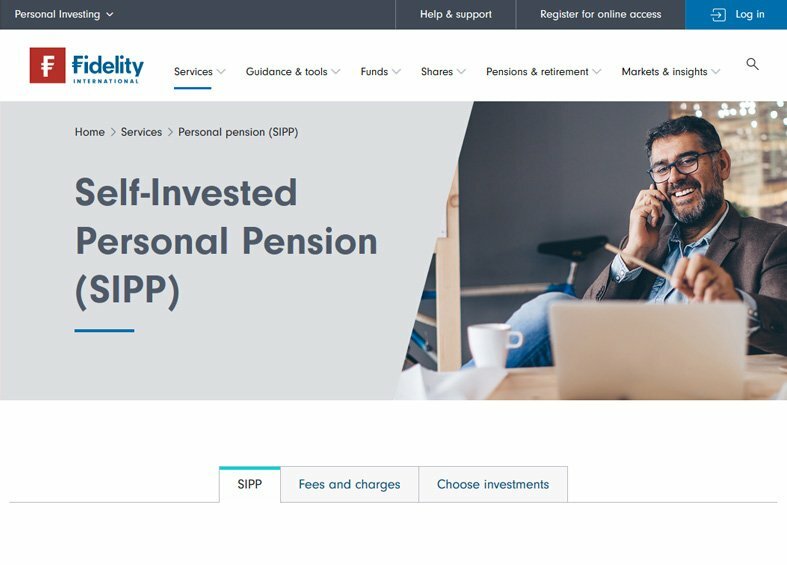 With the Fidelity SIPP you can can start with a lump sum payment from as little as £800, a regular savings plan from as little as £40, or by transferring a pension in. Employers, your limited company, or someone else you know can also pay in. The service fee is just 0.35% (ongoing fund charges apply) – and you can get extra benefits when you invest more than £250,000, including a Relationship Manager and a reduced service fee. You will even get instant access to Fidelity’s investment expertise, market insights and planning tools. And their free UK and Ireland call centres are open from Monday to Saturday. Fidelity’s SIPP, gives you flexible income options when you want to access your money, including drawdown. The fees for the SIPP account are very similar to those of the ISA account. You can start with a lump sum payment from as little as £800, a regular savings plan from as little as £40, or by transferring a pension in. Employers, your limited company, or someone else you know can also pay in. Note: If you have less than £7,500 in total there will be a flat fee of £45 a year (£25 for Junior ISA and Junior SIPP), although this changes to 0.35% if you have a monthly regular savings plan (RSP). Fidelity will usually collect this fee in arrears in monthly instalments of £3.75 (or £2.08 for Junior ISA and Junior SIPP). With Fidelity’s general account you can invest in a wide range of trusts, ETFs and funds. There is no limit to the amount of money you can invest. However, it is important to note that it is not possible to trade actual stocks in this account. To do this, you would need to go use a different broker that does offer this service such as Interactive Brokers. Also, bear in mind that, unlike an ISA or pension, investments in this account are not held within a tax wrapper. Depending on your personal circumstances you may need to pay tax on your returns if they exceed your personal allowances. £1 million+ 0.20% a year for the first £1 million and no service fee for investments over £1 million. This means the maximum fee you will ever pay for all of your personal accounts is £2,000 a year. Fidelity will calculate the service fee the first of every month and deduct it around the 15th of the following month. 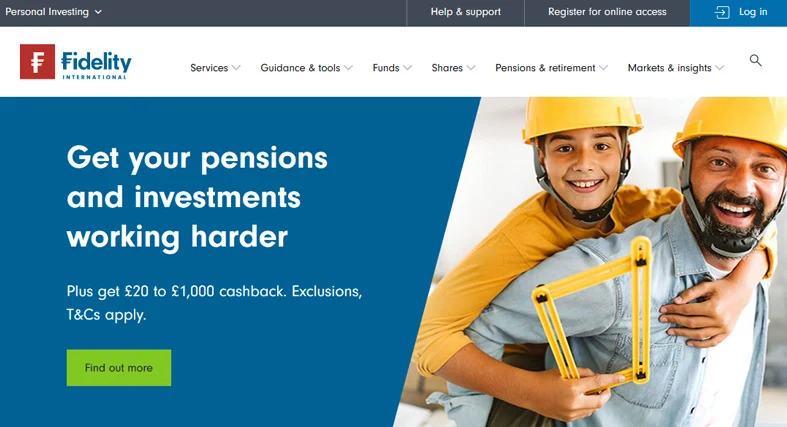 They will include any joint accounts when they are adding up all your investments to work out what service fee rate you pay, ensuring the lowest possible charge. The total value is then divided by 12 to determine the monthly amount that’s taken from your individual account. The service fee is taken directly from your cash account, so it is recommendable to always have cash in that account. If you don’t have enough, they will take it from your largest investment by value and by asset class – for example, they will take the fee from the largest fund before we take it from an Exchange Traded Fund or Investment Trust. On the UK website for Customer Reviews, TrustPilot, Fidelity has a rating of 4 out of 5 stars which is classed as “Great” and a Trust Score of 7.5 out of 10. The comments are overwhelmingly positive, and any negative reviews we found have been replied to by a member of Fidelity’s staff offering them a phone number to speak to customer support to resolve the issue. Some of the negative comments relate to problems registering on the website, being unable to get through on the phone number and complaints about when they changed their website. A great way to monitor and manage my investments. The online facility is very useful and clear and making transactions are easy and convenient. I have had no problems in buying or selling through Fidelity. Fidelity International is very good at what they do. Excellent communication with clients. No hesitation recommending this company. I have been saving with Fidelity for years and feel they have my best interests at heart. I use their app and website to manage my funds, it’s easy and a convenient way to keep track. One of the easiest sites to use. I don’t very often trade shares these days having retired and built up a diverse portfolio under the (PEP) ISA umbrella over many years. On one of the recent occasions I did buy from Fidelity the process wasn’t perfect, I did outline my views at the time. Really pleased with everything – just one thing though. My wife has a great Fidelity app on her iPhone, which enables her to easily and quickly access so much info on her investments. I don’t think a similar app is available on Android (which is what my phone operates on). Am I correct? If so, why is there no equivalent Android app? Isn’t this a major shortcoming in customer service? Fidelity offers one of the widest varieties of trading tools and education resources in the investment brokerage industry. This is a great tool for those who are new in the investment world. The guided process to selecting your stocks is not quite as complete and helpful as other roboadvisors. Furthermore, the fees are somewhat hire than them. Having said, Fidelity is a company with over 50 years of experience and that is a degree of safety and insurance that one can’t simply buy. Fidelity Investments offers a wider range of products, including ETFs, funds, and trusts. Fidelity is very highly regarded in the industry with a solid platform suitable for a range of investors. Along with their user friendly platform, Fidelity offers some very competitive fees for its services. One of the places where it stands out the most is when it comes to the fees for their SIPP accounts, under £250 pounds. If you are looking for a simple and easy way to invest in funds, Fidelity is the way to go. This is a reliable company that can help guide you through your first steps as an investor, as well as help more seasoned investors perfect their portfolio. On the other hand, if you intend to conduct extensive research, there are platforms better suited for this. Certainly, one of the biggest advantages the biggest advantage is the ability to grow on the platform. Fidelity’s many different investment services make this possible. While Fidelity is overall a well established and reliable company, it’s important to conduct some research and check out all the available alternatives. There are many other investment platforms out there, and some of them might be better suited for your exact needs. Alternatives for Fidelity could include, AJ Bell, Vanguard, Hargreaves Lansdown and Interactive brokers. Each platform has its ups and downs and is best suited for a different type of investor. However, Fidelity is, on the whole, a good company, and since it actually has no exit fees I would highly recommend using it since you have nothing to lose. In fact, they will even help you transfer your funds to them by paying up to £500 pounds in penalty fees. 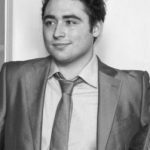 Based in Barcelona - Spain, James is an Economics Graduate and Financial Advisor offering advice on Pension Plans, Insurance & Mortgages. He has been writing about economics and investments for 7 years.